This part of the approach may take some time to do it properly, so it would be worth blocking out a space in your diary to set up a system effectively. Don’t worry that you have to take you whole life in one go however, that would seem too overwhelming and you will possibly give up part way through. This methodology can be done in stages, until you have built your system and it becomes a trusted location for all your commitments. This approach would be so easy if you were landing on the planet for the first time; in other words, we had no backlog and we were starting afresh. However, this is science fiction, and for many of us there is some chaos that we need to address before we can really get moving with this approach. Actually, I did have a teacher who had spent a year in Canada, and she said it was just like ‘landing on the planet for the first time’. She had no backlog, a new mobile phone, and people weren’t expecting her to pop in every few minutes. She said it was great, but experience shows that even where this happens, our chaos can form quite quickly. One participant said she knew someone (I’m not sure if she meant herself) who regularly moved jobs when the paperwork and chaos became too overwhelming. I suppose that might be an option if you were desperate, but for many of us this isn’t practical. 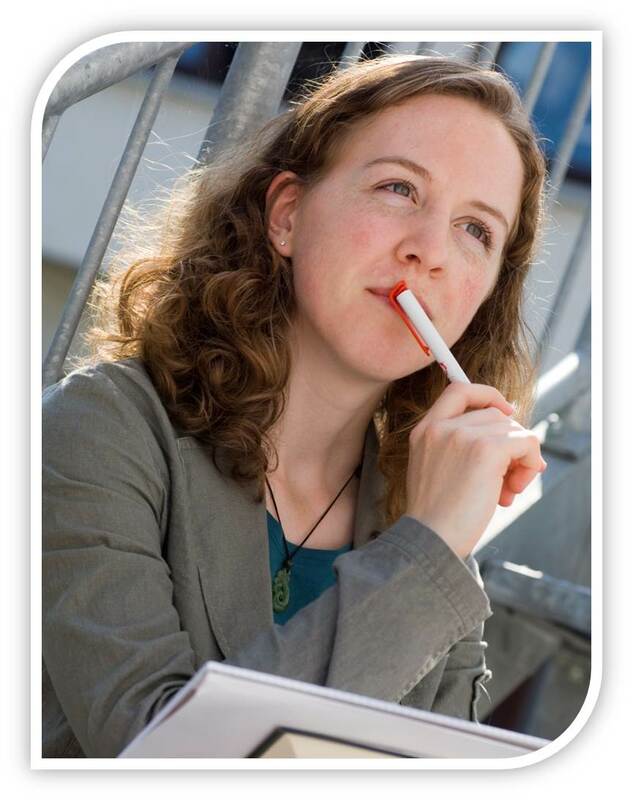 So how do you actually implement the methodology we’ve described so far during this course? And in particular, how do you apply this approach to the stuff that has accumulated over the months and years? Until this is in order, our system is not going to feel complete and straddling between two systems, can create another element of stress. I’m a firm believer that we should jump right in where we are rather than wait until everything’s perfect which would of course create that vicious circle which is so often the death to many great opportunities. Actually, it would be worth treating setting up a system as a project in itself, especially based on the earlier definition from the project section under the Depths of Perspective. So let’s demonstrate how to deal with the backlog and start to bring order to your life. To do this, we’ll look at the first three stages of Workflow so if you haven’t covered this section yet, it would be worth doing so before looking at these stages. This can work with pretty much any area of your life; your office desk, home office, the piles of letters around the house, your briefcase, the garage, the loft, the garden, and so forth. The first phase is “Capture.” We could equally use words like collect, collate, catch, corral or gather. So the first thing to do is just bring all this stuff together in one confined area. When I use the term “stuff” I refer to anything that potentially has a next action or is incomplete. Something needs to happen to it. On the basis of this, we can leave out anything which is furniture, decorations or stationery. The office chair; in most cases there is no next action for the chair so you can leave that. The tub of paperclips on your desk; equally there is no incomplete action and this can stay where it is. The picture on your wall likely has no next action and can also remain in place. However, you should view everything else as a potential next action, or possibly even a project. Include in this all the loose bits of paper, post-it notes, letters and magazines. 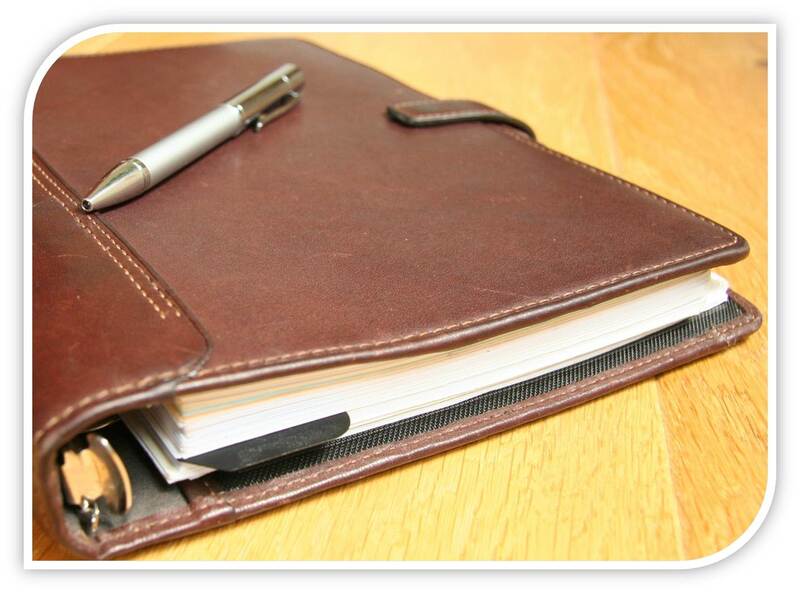 It may be a good idea to add your notebooks, to-do lists, Filofaxes, diaries and planners in your collection process. In fact it would likely be helpful to also print off e-mails at this stage and make a note of any voice-mails. If you have many thousands in your inbox, you might want to review the e-mail section of this course in the Challenges section which will help you reduce that list dramatically before printing off reams of paper and destroying a small forest in the process. If you decide to use your in tray as the collection zone for this phase, that’s fine. As an aside, however, once you’ve completed this process make sure you use your in tray for one purpose only. Quite often I find that people mix the usage of their in trays; they will use it to collect their letters and mail, but then also keep some magazines here to read sometime later. They will also keep a copy of the internal phone book here and so on. 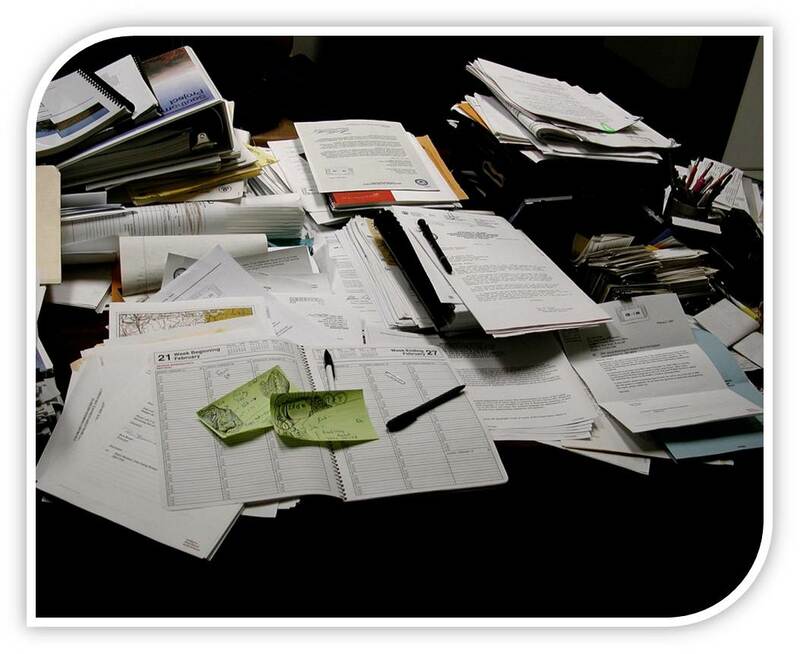 Once we mix the categories, these organisational tools lose their meaning, further adding to the stress. Nonetheless, as a temporary tool, while you set up your system, your in-tray is as good as anything. In fairness, it will soon be very likely overflowing. If and when that happens, I know of some who put a box on the floor next to the desk and continue the capturing process by using the box. 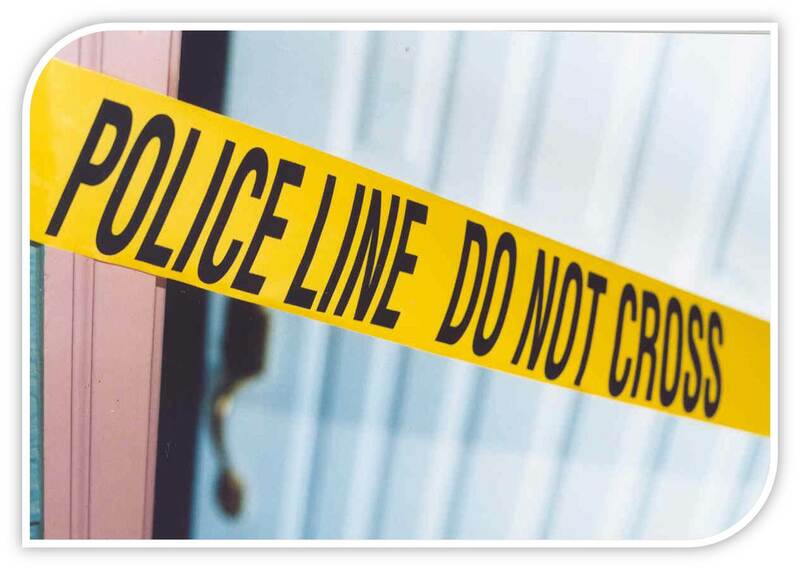 In fact I know of some who have to cordon entire areas of their office with police tape to carry on the capture phase. Let me give you an extended example to emphasize the point. A broken printer stuck under your desk. It’s been there for months gathering dust. It has a next action, and may even be a project. Now I’m not suggesting picking up the printer and putting it into your in tray, but how about writing a brief note and popping that into the tray – now you’ve captured a representation of the object. Stage 2 in the Workflow methodology is Clarify. I should repeat that if you haven’t yet covered the material in the earlier part of the course you might find it worth doing that before watching this section. This stage is very simple. Go through all the stuff you have corralled or gathered together and process it one at a time. As you this, pick up each piece of paper and ask “what does this mean?” and “what is the next action?” This is simply a case of finishing off the thinking. A key practice to this stage of the process, is not to sort and shuffle through all the papers trying to decide which one jumps out at us, only dealing with the things that make us feel warm and fuzzy because these are clear to us. Go through each item from top to bottom and get it into the system. This takes us to the next and most critical part of the process; setting up lists. There are a variety of tools you can use and we will discuss a variety of them through the remainder of this section. What tool would be perfect for you? Well there is no perfect list manager out there, and if you wait until the perfect tool, you will be waiting for a long time. That said, there are many really good solutions and actually the tool you choose isn’t that important. Sometimes, high tech people want their tools to do the thinking for them, hoping that when they look at the list, the system will tell them which job to do next and possibly even how. We are a long way off that being an effective management approach and we should learn to take the executive decision ourselves not hope that something will do that for us. However, we can set up our tools to support us in this decision making process and we will demonstrate how to that with a variety of tools on offer. How should you choose the tool best suited to your needs? Here are a few questions to ask yourself that might help in that decision. SHOULD I GO DIGITAL OR PAPER? The answer to this question is largely related to ease of use. If you have to start thinking about how to use your system, which buttons to press, which key combination to hit or which folders to view, then your system is likely to cause a drag on your process. If you do decide to go digital however, and there are many excellent applications available to support you, it is worth investing the time to become au fait with the tools, both hardware and software. WHAT HAPPENS IF I EVER LOSE IT? This question applies to both paper and digital. You could leave your paper planner on your car roof as you drive out of the car park. Equally, what happens if the company that hosts your system ever decides to close its doors? What happens if your company’s Microsoft Exchange servers haven’t been backed up as you were promised and you lose your Microsoft Outlook data? My experience is that we can let this worry us more than necessary. If you ever lost your data for whatever reason, you will find much of it is in your memory. Should this happen, just start to do a mental download and you will quickly rebuild your system. WOULD I FEEL COMFORTABLE CARRYING IT AROUND? I tend to demonstrate paper based systems using an A4 folder so it’s visible to a group. However, you might feel that this is too cumbersome; that’s fine. Choose something that will not put you off carrying with you. If you regularly leave it behind at home, in the car, on the desk because it’s just too big, then it’s not really going to be your trusted system, is it? It’s easy for me to demonstrate a system with half a dozen tasks in it, but how well will it work when I’ve been using this for 6 months and the system is getting busy. The tool you choose needs to work when you have embedded it into your daily routine for an entire year. WOULD I TRUST PUTTING ANYTHING IN IT? Again this question applies to both paper and digital. When I work with criminal justice professionals there can naturally be a concern for security or data. When you add a task in your to do system, and take it out with you on the road, what happens if you leave it on a train? With digital systems that are not hosted by an external provider, this will be easier to manage and most electronic tools have password protection as an option (if it is used). However, if you do decide to use paper and pen or an electronic system that is hosted by someone else, I regularly advocate either noting the name of the person who the task is related to, or the issue itself. It might be best however not to include both elements. Either piece of information will hopefully be enough to trigger the action in your mind. DO I NEED TO SYNC TO ANYTHING? I do find some people can become so hung up on this issue and again fall into the trap of trying to get the perfect system rather than just getting going. It might be possible to print out your lists and have them with you in your paper planner and many of the electronic tools have better printing options than might be initially obvious. However, if you do need to sync it with other tools, then this would certainly be easier if you choose something digital. That said, if you work in a large organization you might still be hampered by policies relating to tethering PDAs and smartphones to your corporate network. There is such a variety of tools available with a wide range of costs. This does not have to be too expensive, and I advocate not spending a fortune especially in the early instances. You can spend approx. £30 on a nice black A4 folder from many stationers. You could spend £100 buying a high quality leather Filofax or £2.50 getting a cheap folder from a supermarket with divider tabs. You could use your Blackberry or pay £500 for an iPad. Any of these tools can work as long as you make the commitment and have the intention to utilize them effectively. I’m not convinced that people who have paid 200 times for one tool over another are likely to be 200 times more effective than their counterparts. From the questions above, you will likely come up with one of 3 groups of tools. I should stress that I have no links with any of these organizations and do not receive any payments from them. I have used, or at least “played with”, all of these tools and am able to give an unbiased opinion on each option. Remember however, what works for one will not be ideal for another, and there is no right or wrong. If someone is mandated to use a particular application and feel forced, they will likely use it sporadically at best and it adds more stress rather than becoming their trusted system that they feel they own. Remember the Milk, Toodledo, Nozebe, and Omnifocus are all example tools that have cloud based options. This allows you to add your next actions in a variety of ways and automatically synchronize them to other devices often through the air (wirelessly). For example, you might be at your computer and through Internet Explorer you can add a task to do later at home and another thing to buy when you are out at the shops. Automatically that updates your Mac in your living room providing a synchronized view of your tasks. In addition, it also automatically syncs your iPhone so that when you are out at the shops you have your lists with you here as well. This used to be a holy grail for productivity geeks, but is now routine and we will demonstrate how you would set up a variety of these options. 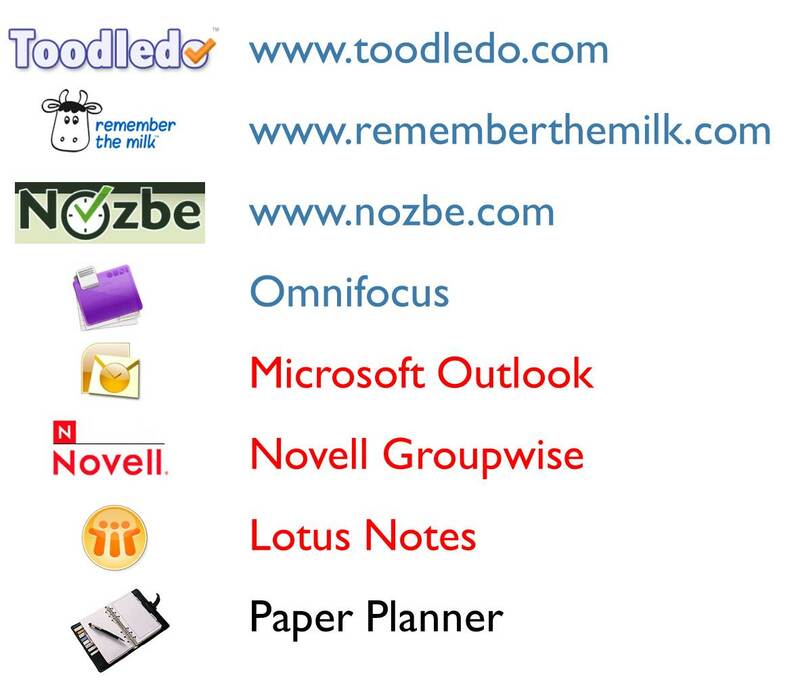 The middle group are typical corporate tools and include Microsoft Outlook, Novell Groupwise, Lotus Notes or Entourage. At the low level are diaries, paper planners and so forth. Again I emphasize that because they are at the bottom of the list does not mean that they are less effective tools. Lists are only of value if you have them with you when you need them. In the remainder of this section, you will find videos and set up guides for a variety of tools. The list is not exhaustive, nor is it designed to be a full user guide to using each of these tools. There are many other courses that describe how to use Microsoft Outlook in depth. These guides are designed how to customize these tools to support the approach we have described throughout the rest of the course. Having recently completed two sessions of training I have considered my options and the tools I will use to manage the incoming data. I will be using electronic corporate tools such as one note and outlook. I am now working with brain toss, very handy capture tool, and office lens. I have persuaded the boss to allow me an HP Elitebook which I’m slowly configuring and building the tools to allow for better management of stuff. There is a learning process on my part as many of the less used/unfamiliar functions of the tools will require practice and use of to gain competence and efficiency. That said I’m in it for the long haul and will continue to invest time to gain the knowledge and skills required to make it work. You mention the potential difficulty of working within an organisations IT policy and procedures, that is a barrier with my organisation with regard to making all the devices communicate with each other across a number of platforms. I’ve an android work phone iOS personal phone, corporate laptop and personal laptop, however that said I think I have worked out how to get the best use of what I have pulled together and formulated a plan as to how best manage the data across each of the devices.